The CÉCI offers, each year during Fall, a full-fledge offer in training sessions for researchers using, or willing to use, the CÉCI clusters. The training sessions are hosted in Louvain-la-Neuve and are organised in collaboration with the CISM, SMCS, ELIC, INMA, CP3, and NAPS. 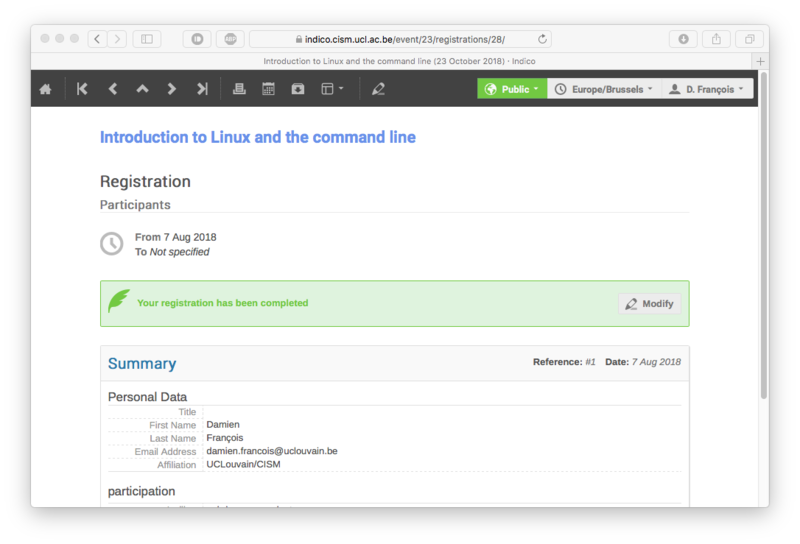 The whole offer goes from baby steps into the Linux world to extreme MPI programming and GPU computing. The sessions are readily cluster-oriented, so knowledge of a programming language or of a scientific computing software is assumed. Training session are delivered in English. The next sessions will be in organised in Octobre and November 2019. Click on a topic in the image below to get detailed information. Practical information available at the bottom of this page. The next sessions will be organised in October 2018. The slides of the 2017 edition are available below. 12:00 -> 12:45 Visit of the computer rooms. This first session introduces to the field of high performance computing and presents the whole training offer. Prerequisite for: all the other sessions. Must: This session is mandatory. Linux is the most common operating system in the HPC world. Basic understanding of Linux and GNU commands are necessary to take advantage of the clusters. 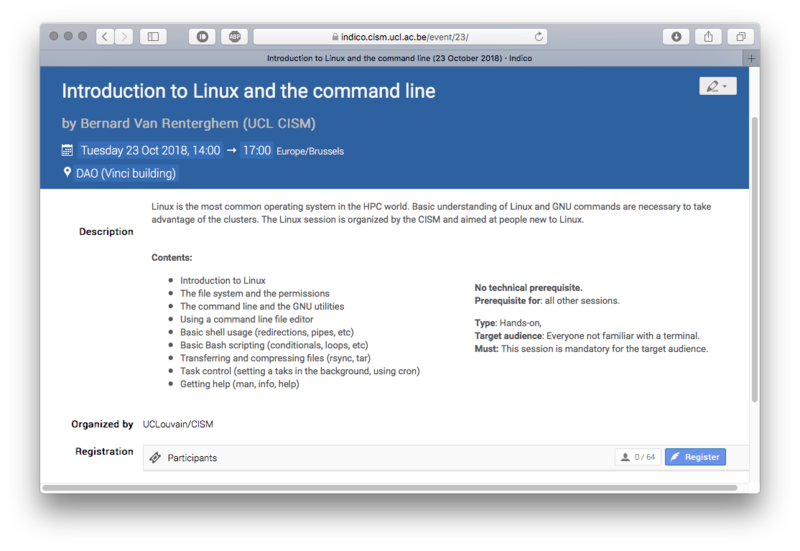 The Linux session is organized by the CISM and aimed at people new to Linux. Prerequisite for: all other sessions. Target audience: Everyone not familiar with a terminal. Must: This session is mandatory for the target audience. Fortran is the historical language of scientific computing. Many often-used mathematical libraries used nowadays were writen initially in Fortran and have evolved with both the language and the hardware. Must: This session is a nice-to-have for those who need to develop fast scientific software. C++ is often regarded as a fast, multi-purpose, programming language, based on the Object-Oriented paradigm that allows mapping natural, or in a scientific context, mathematical objects to a representation in a computer for processing. Python is a programming language that can be used both for scientific computing (as a replacement for Fortran or C/C++) and for everyday scripting (as a replacement for Bash or Perl), but also to develop full programs with a GUI as well as headless services. It is a very nice tool to include in any scientist's toolbox. Must: This session is a nice-to-have for those who do not know Python. Often, the workflow for researchers is to acquire a piece of software, and either modify it, or wrap it in scripts, or simply install it on the clusters, or all of that at the same time, on many clusters. This session will introduce to the tools that can make this whole process easier. Types of languages and the choice of the language. Must: This session is a nice-to-have. Software installed on the clusters is organised and managed with environment modules that allow choosing a specific version of a software package compiled with a given compiler, linked to chosen libraries, etc. This session explains how modules are used on the clusters. Must: This session is a must for anyone. The choice of the compiler (many clusters have several, a.o. gcc, intel, etc.) is important, as is the choice of the compiling options. This sessions reviews the strengths and weaknesses of the compilers and their optimal use. Must: This session is a must for anyone who needs to compile software from sources. Interpreted languages are often thought as less performance-oriented than compiled languages. Yet, they are often much easier to use and the time spent developing code is much lower than with compiled languages, and many tools are available to make them nearly as performant as compiled languages. Before diving into the concrete programming examples with MPI and OpenMP, this session introduces some theoretical concepts and presents the several paradigms and tools offered by Linux for parallel computing when a program itself is not able to run in parallel. Theoretical concepts: parallelism, speedup, scaling, overhead, etc. MPI is a standard for passing messages between processes running on distinct computers. It offers high-level primitives for efficient communication. 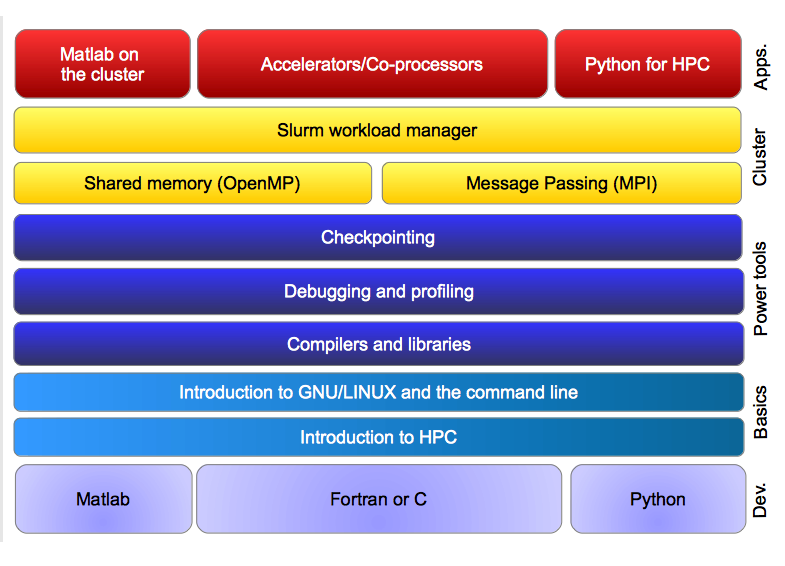 OpenMP is an easy alternative to pthreads for multithread computing. OpenMP extensions now exist in most C and Fortran compilers and allow flagging loops and other construct for efficient multithreading with little supplementary programming effort. Singularity is a container solution for HPC. Containers help with reproducibility as they nicely package software and data dependencies, along with libraries that are needed. It allows users to install and run software that required root access to be installed on clusters where they only have regular user permissions. The rationale is to perform all the software installation in a container image (a kind of lightweight virtual machine, that can use a different Linux distribution than the one on the compute nodes!) on a machine where you have root access and then transfer and run that image on the machine on which you do not have root access. Images can be built from recipes shared by others, and from recipes made for Docker, the leader container solution outside the HPC world. Slurm is the job manager installed on all CÉCI clusters. The session teaches attendees how to prepare a submission script, how to submit, monitor, and manage jobs on the clusters. Checkpointing and Restarting, or the art of stopping some computations to continue them later, or on another computer, is a very convenient way to get past time limits set on the clusters, and to protect against hardware or software failure on the compute nodes. Must: This session is a must-have for anyone feeling oppressed by time limits. Many scientific workflow involve submitting and managing a large number of jobs. This session explores the software that make that process easier. Must: This session is a must-have for anyone who happens to write scripts that create submission scripts and automatically submits them. When a piece of software does not work the way it is expected to, it needs debugging. Then, when it works, it needs profiling to remove the bottlenecks. Must: This session is important for programmers who want to optimize their code for usage on a cluster. Accelerators, or co-processors, are more and more common in HPC, especially GPU's and Xeon Phi's. They offer intense performances (sometimes a whole cluster in a single compute node) but they also come with challenges that must be addressed to benefit from their compute power. This sessions gives the tools to decide whether or not one should invest time and effort into porting their code on accelerators, and how to configure/compile software to use them. Code versioning is very important to master, even for non programmers. 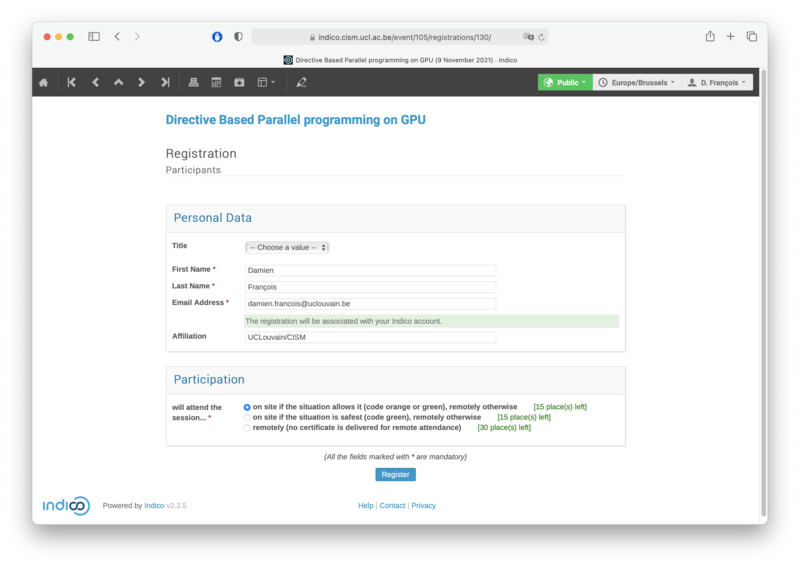 It allows tracking the changes made to a submission script, a piece of code, a configuration file, or event a dataset and propagate the changes in a consistent and systematic way to all clusters. Must: This session is a must-have for anyone not familiar with Git. High-performance compute and BigData are two disciplines that used to be higly compartmented, but are not anymore. 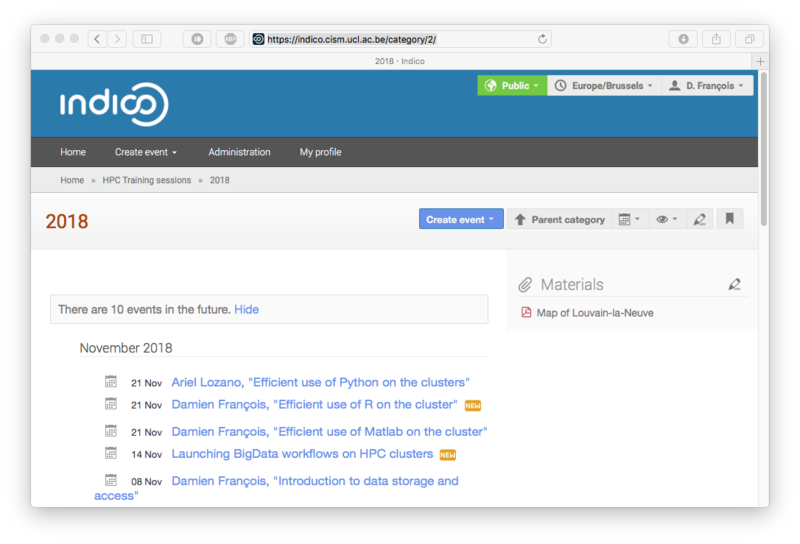 More and more HPC users get interested in BigData software, and more and more BigData users get interested in HPC hardware. This session will broadly present the tools and concepts associated with BigData and explain how they can be used in the CÉCI context. Must: This session is a must-have for anyone who would like to go see what exist behind the buzzword. Storing data in an efficient way is very important for many scientific applications. Yet, most of the time, a myriad of small files is used, imposing a large burdun on the file system, spending a lot of time in file access, making transfers very inefficients, etc. Other solutions exist and are presented in this session. Must: This session is a must-have for anyone who thinks generating a million small files is an optimal way of storing data. Matlab, and its free, mostly-compatible, alternative Octave are becoming more and more suitable for cluster computing with the rise of parallel computing toolboxes and/or syntactical constructs. The session explores the many was Matlab code can be parallelised and submitted to a cluster (taking into account the tough problem of licensing). Must: This session is a must-have for anyone who wonders why Matlab is not installed on the CÉCI clusters. R is and more suitable for cluster computing with the rise of parallel computing toolboxes and/or syntactical constructs. The session explores the many was R code can be parallelised and submitted to a cluster. The use of Python for scientific computing is rising thanks to modules such as numpy, scipy and mathplotlib. This session explores the efficient uses of Python in that context for situations where numpy and co. are of less use. It assumes a working knowledge of Python. Slides: v2016 (html), v2017 (pdf). Must: This session is a must-have for anyone thinks Python is slow. The sessions are organised in Louvain-la-Neuve in the upper part of the city. Most sessions take place in the Vinci building, located on 'Place Sainte-Barbe'. Enter the building through its east-side gate entrance (located on Place Sainte Barbe, not through the main doors) and then turn right in the inner courtyard. Enter the building through the door in front of you and go towards the right corridor. 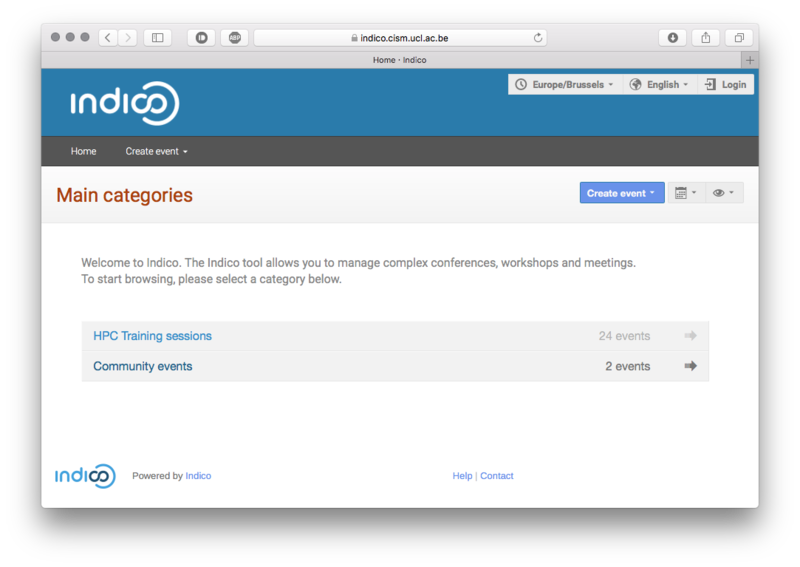 The specific room is announced on the page of each session in the Indico event management system. Beware, the first session will be held in a different building: The 'Auditoire des Sciences, located on Place des Sciences (See the maps below). If you come by train, you will arrive in the center of the city. Climb the outside stairs and go through the station straight in front of you. Get out of the station from the opposite entrance. From there, turn left and follow the road until you reach a wooden place ('Place des Sciences'). Get around the place by the right, pass the Museum and aim for the Barbe building that stands just behind the Musem. Bypass the Barbe building (by either side, or even through it) and you will reach the Place Sainte-Barbe. The closest parking space available for visitors is the parking Baudouin 1er. That place is free. Beware that most other parking places in the area are restricted, or not free. Exit the parking by the other entrance, the one that does not lead to the the main boulevard and walk along the boulevard until you reach a tunnel that will allow you to cross the boulevard. Follow the path on your right, cross the road and go straight. You arrive at Place Sainte-Barbe. Participants are encouraged to request a CÉCI account prior to attending the training sessions. A set of generic accounts will be available for participants who are not eligible for a CÉCI account. If you plan on using a desktop computer in the room (as opposed to bringin your own laptop), please make sure to bring a USB storage key with you to save your configuration and files from one session to another. All participants will receive a certificate of participation provided they sign an attendance sheet at then end of each session they attend. The certificates of participation will be sent in early December. If you bring your laptop, you will be able to connect it to the WiFi thanks to Eduroam. Please make sure you can connect to Eduroam before you come to Louvain-la-Neuve, and seek assistance from your local IT support staff in case you cannot connect. Registration is free but mendatory. The room capacity is 27 workstation + 37 additional seats. If you register but are unable to attend, you are required to unregister as soon as possible . Important note: if you plan on using a computer in the room and you do not have a UCL account, please bring a USB storage key with you to avoid loosing files from one session to the other. Beware that sessions that are marked as mandatory must be attended ; all the material covered in those sessions is a requirement for all the subsequent sessions. For instance, after the session about SSH, we will assume all participants are able to connect to the cluster without assistance. Notions such as SSH agent and SSH proxy must be mastered by the participents. Please pay attention to the requirements of the sessions you register to. You can direct all your questions to egs-cism@listes.uclouvain.be. Be sure to include '[Training]' in the subject of your email for faster processing. Important note: Please create your CÉCI account before attending the session. 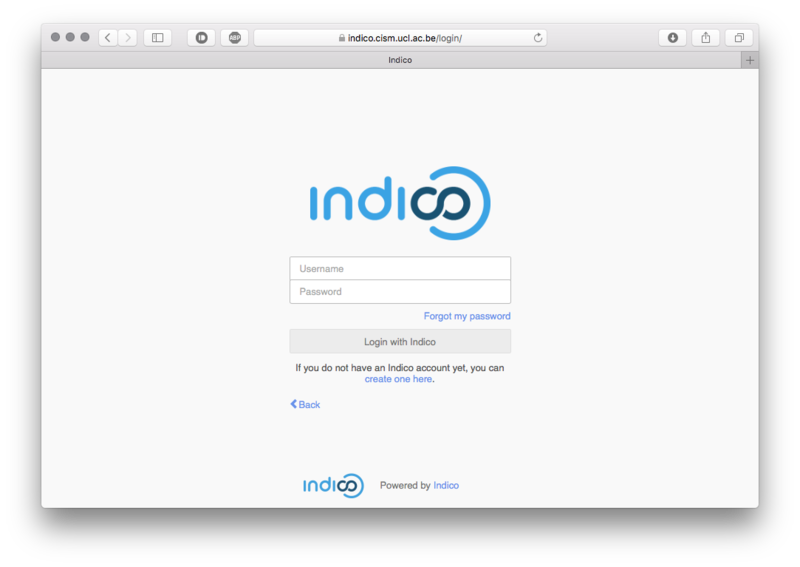 The first step is to create an account in the Indico event management system. To do so, please go to https://indico.cism.ucl.ac.be. 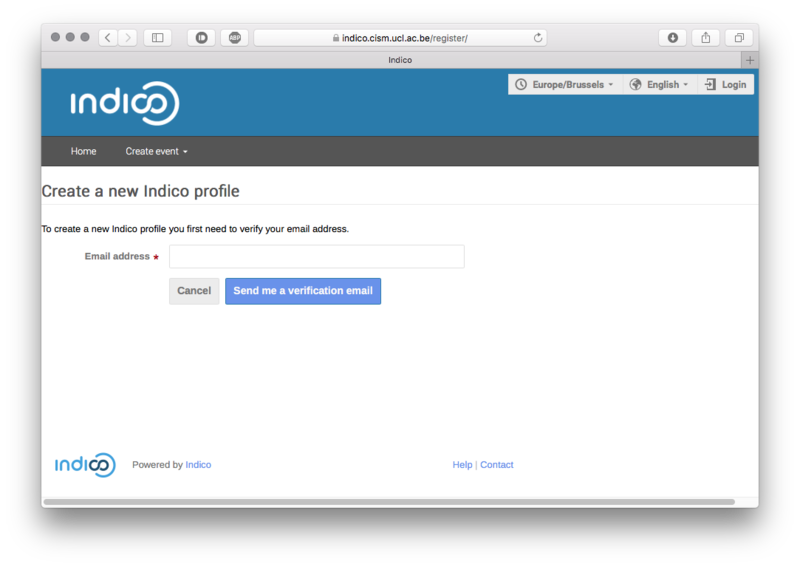 Note that this website is only reachable from within a CÉCI university network ! Enter your email address (preferably your institutional email rather than a generic @gmail address and click on the link you receive by email to complete the registration procedure. Important: Please create your account with the same login you have with your CÉCI account. Once you are logged in, choose 'HPC traning sessions > 2018', or click on this link to see the list of training sessions. Make sure to unfold the view if the page says 'There are 11 events in the future. Show' to view the whole list of sessions. Click on each session, review them, and decide the one which you want to attend. Please note that the first session 'Introduction to HPC' is mandatory, and the ' Introduction to Linux and the command line' and 'Connecting with SSH: Introduction and advanced topics' are mandatory unless you are very confident with those topics. They are prerequisiste for the subsequent sessions, and no help will be available with respect to those topics afterwards. The upper part of the form will be pre-filled with your account data. In the bottom part of the form, please choose weither you will use a computer in the room or if you will bring your own laptop. The number of places left is indicated next to each option. If the option you choose is not available, please try again later in the hope someone unregisters and leaves a place vacant. Once you click on 'Register', you get an email with a summary of the data you entered, and a link to manage your registration to that event. Make sure to save the session in your calendar. You can do so easily by clicking on the calendar icon in the top part of the page. You can have a summary of your registration by consulting your dashboard. and choose option 'I will finally not attend this session'. This will free a seat for someone else.